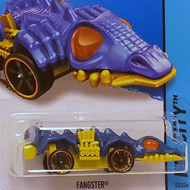 147/250 is part of the HW Race series and the 2014 Treasure Hunt set. 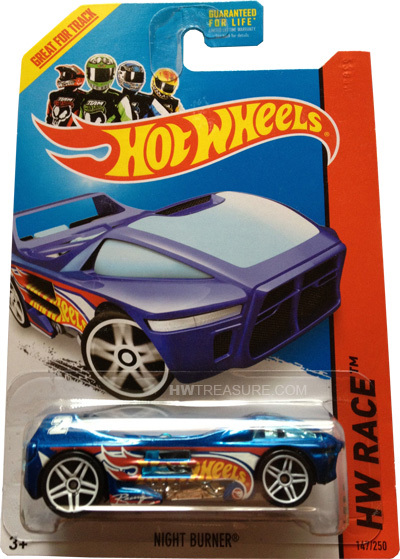 The sides of the metalflake blue car sport a large Hot Wheels logo, red & white graphics, “2”, “Racing”, and the low production symbol. It has light blue tinted windows, PR5 wheels, and a black plastic Malaysia base. The Night Burner was originally released in 2006 as the First Edition known as Mega Thrust. If you blow into the exhaust pipe the turbine spins and whistles.